Pumpkin "Style" Pie? What WILL They Think of Next? Took this picture yesterday at the Commissary. I’ll let the picture speak for itself. 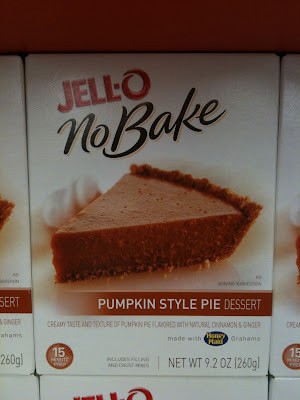 The subtitle below says “Creamy taste and texture of pumpkin pie flavored with natural cinnamon & ginger”. I don’t know what to say about this pie-ish product. Many times you guys have known me to whine about processed foods. That’s not to say I keep my house free of them. Depending on how busy our lives are, I’ve been known to stash a tray of frozen chicken enchiladas in the freezer or Kraft Macaroni & Cheese in the pantry. You’ve also known me to buy some of these crazier foods and do taste tests with my kids comparing it to a homemade version. But I couldn’t bring myself to buy this. Heck, I’m even somewhat uncomfortable buying canned pumpkin for pie, although according to the can there’s nothing in the can except pumpkin, right? Mashed steamed pumpkin makes the pie SO good! Dave goes back to work tomorrow. He’s in really good shape to return and is ready to get back to society. Not 100% pain free, but most of his day he’s pretty comfortable. He’s tapered off his meds enough that I think he’ll be okay, so long as he takes it easy physically. I think mentally he’s definitely good to go for returning to work! And then I can get my house back! And clean things up some! It’s been utter chaos…Dave has traditionally helped with SOME of the housework — whether it’s folding laundry or washing dishes a few times per week. I’ve been able to keep the house clean…i.e., free of dirt, but it’s been cluttery beyond even MY personal standards! Also, tomorrow’s the last day of NaBloPoMo. I didn’t succeed in the full challenge, but I am proud for having blogged every day in the month of November so far, except for the 20th. Where I simply had a brain fart, I guess. Later this week I’ll be dusting off my holiday cookie posts from years past. I make a couple of fun, unique cookie recipes, along with the classic sugar cookies and spritz cookies. I’ll just re-boot the older posts. I don’t plan to change anything this year, I promise! Let me start with a Dave Update: Dave’s days are doing pretty well. He’s in a bit of a conundrum because as his leg muscles tighten up overnight, he awakens every morning with VERY uncomfortable leg and glute pains. Within a few minutes of awakening, he’s much improved. But he says that the morning pains are pretty bad. He keeps meeting more and more people who have had variations on the spinal fusion he’s had and they all assure him that by 6 months he’ll “feel like a new man” or he’ll “feel like a million bucks” or he “won’t believe how much better things will be”. My fingers are crossed! As I’d mentioned in yesterday’s post, I made the sweet potato casserole I’d referenced. This ended up being a very yummy, but plain, sweet potato casserole. 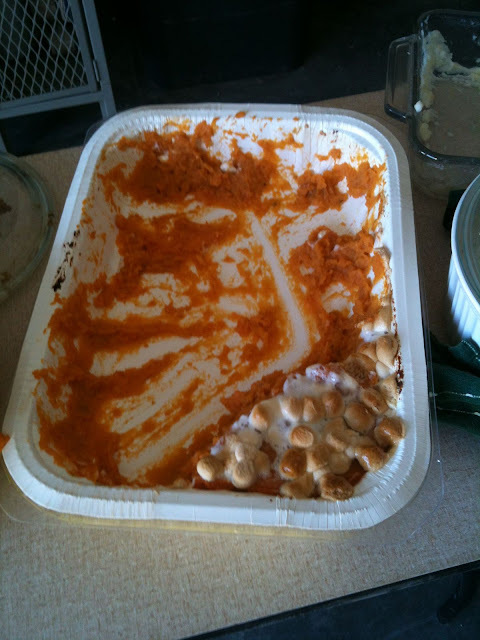 I made the recipe with six pounds of sweet potatoes and it filled up a disposable paper baking dish amply for Dave’s squadron Thanksgiving pot luck today. I diced and steamed the tubers last night and mashed them ahead of time. The steaming technique is faster than baking; I learned about this from Alton Brown’s sweet potato episode of Good Eats. 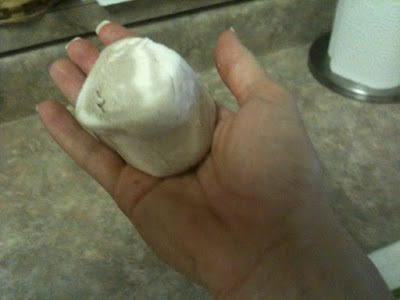 This morning, I just stuck everything in the stand mixer and let ‘er rip with the other ingredients. It was then that I noticed that this recipe didn’t have any cinnamon or cloves. This was a first for the few times I’ve made sweet potato casserole, but it turned out really good just the same. I guess it’s more child-friendly that way? Tomorrow we’ll be spending Thanksgiving with a family who lives near Eglin Air Force Base, right up the road from us. We all lived in Irvin Hall at Penn State back in the day. And now we’re practically neighbors! Hubby’s in Afghanistan for the holidays, and wifey has a house full of relatives visiting and she’s doing a classic Thanksgiving get-together tomorrow. The kids are looking forward to seeing each other, and Jacob has asked to bring his new Apples to Apples game to play. I offered to bring several vegetable dishes and a pecan pie. I’ll write about the pie tomorrow — it’s special and I don’t want to write about it until I can offer the thumbs-up or thumbs-down verdict. 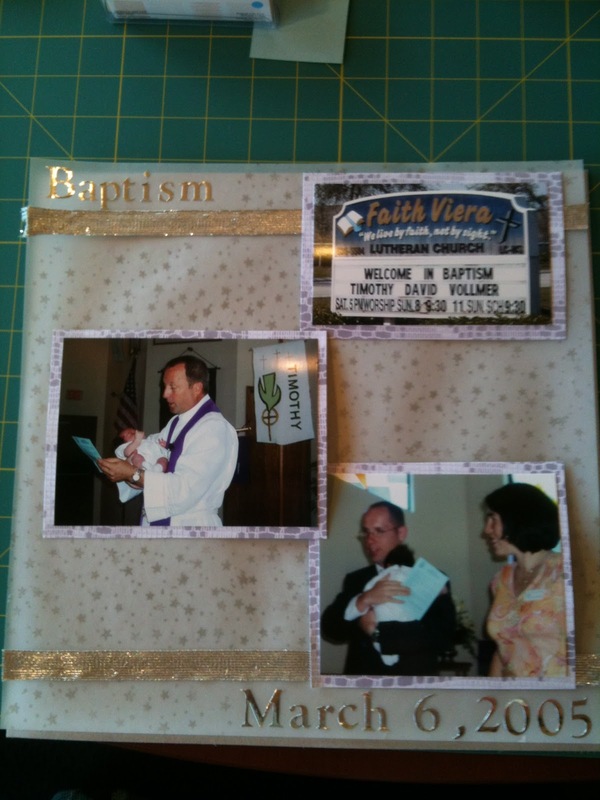 The paper baking pans are great! These are by Hefty. I know not everyone likes it this way, but I like the mini-marshmallows on top. Because there simply isn’t enough sugar in this recipe, right? There were two casseroles at the pot luck and this was all that was left of either of them after about 50 people went through the line. Dave’s 2 week checkup was yesterday. He’s doing MUCH better now and both his neurosurgeon and primary care doctor (the military doctor who he sees more often) are both impressed with how well he’s doing! We’re thrilled with the upward turn in his recovery compared to last weekend. And Dave’s attitude is so great right now! 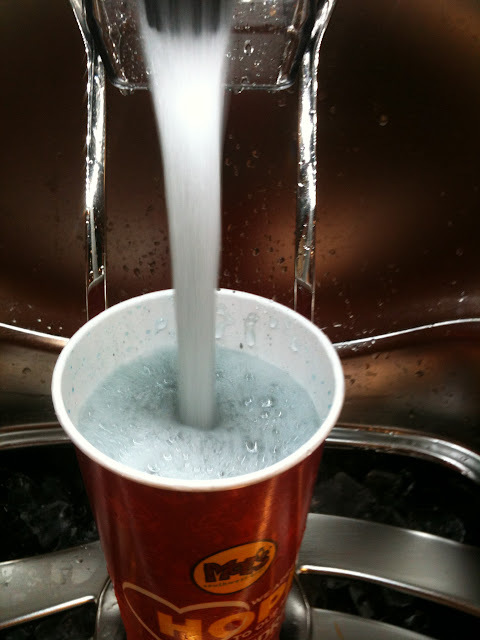 Today, after Dave’s primary care appointment, we headed over to our local Moe’s for lunch. 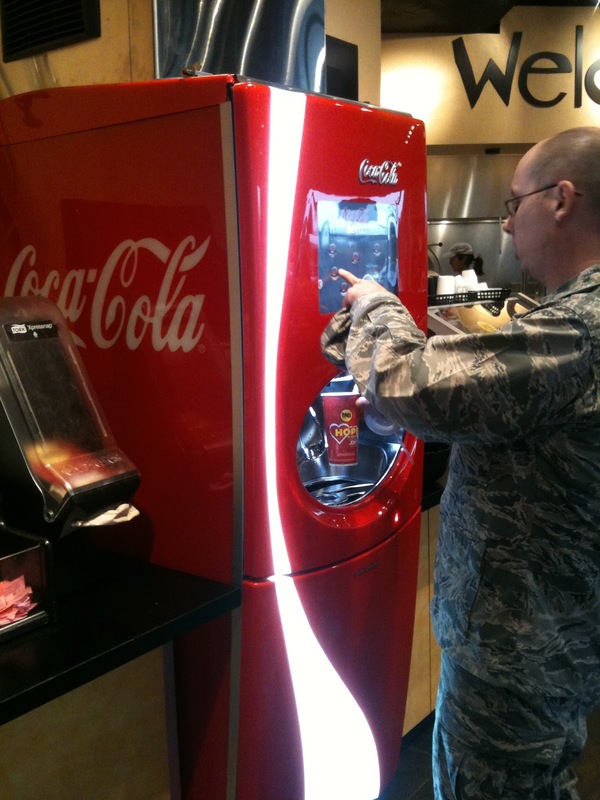 I hadn’t been to the Fort Walton Beach Moe’s in a couple months, so we were intrigued by this new machine there. Just so you know, I was NOT the only one taking pictures of this thing 🙂 Dave was in uniform for his medical appointment on base. 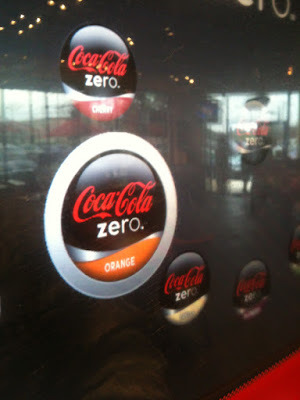 This is called the Coca-Cola Freestyle machine, and it’s some sort of computerized machine that will give you over 100 combinations of Coke products! Want Coke? Diet Coke? Coke Zero? Sprite? Diet Sprite? Fanta? Fanta Zero? You can have all that! AND you can add flavors on the spot…Dave and I were intrigued! This is a touch screen. Choose first the baseline Coke product you want. And somehow it pulls it all together and dispenses it. This was “grape Fanta Zero” and it was rather, um, BLUE. I Love Men Who Can Cook! There are so many skills to be learned when cooking: math, nutrition, chemistry, physics! Dave Update: We had a rough couple of days. Incidentally, we had read another Axia-LIF patient’s online blog/diary/series of forum posts that read rather similarly. At about the one-week point, the patient was feeling better, he thought he could move around a bit more. But that was probably not the best idea. So then at day 9, this patient was struck with the worst pain of his entire life. Things calmed down for him by the two week point though. Dave had a similar experience. So we ended up at the ER on Thursday night from the muscular spasm pain — described by Dave as “10 out of 10” on the pain scale, and on Saturday night Dave experienced the same pain. He said it made the pre-surgery back problems nothing at all. These spasms were happening at about the same time of the evening (around 10:30-11:00pm). Instead of going straight to the ER again on Saturday night, this time I called Dave’s doctor and we discussed why these muscle spasms were happening. He’s speculating that the muscles have been so traumatized by the 8 1/2 years of back problems, they’ll need their own healing process. In the meantime, we elected NOT to go the ER Saturday night, Dave took some ibuprofen and that actually seemed to help things quite a bit. Up till Saturday night, he had NOT been taking any anti-inflammatories and taking some might have made all the difference. Today was much better for him, hopefully we’re over the hump and he can continue healing. It was certainly a challenge keeping positive Thursday – Saturday and it’s nice to be thinking happy thoughts again. I Love Men Who Can Cook: Dave had this week’s Bear Cub Scout den meeting at our house, the boys had a cooking/nutrition requirement and their normal meeting location didn’t have a kitchen readily available. So the boys took over my kitchen. I set out the ingredients and helped get the cookies in/out of the oven, but that’s all I did. While the cookies were baking, the boys made some trail mix — each scout brought over a package of one ingredient: M&Ms, peanuts, raisins, dried cranberries, and cereal. It was really good! Oh I wish I had our real camera so I could better capture that egg falling into the bowl. This was with my phone camera. Okay, not the most attractive oatmeal cookies, but they sure were yummy! I think the boys were scared of them! Homemade trail mix – yum! A Nice Surprise! Hammond’s Pretzels! Dave Update: Yesterday and this morning Dave was quite sore. 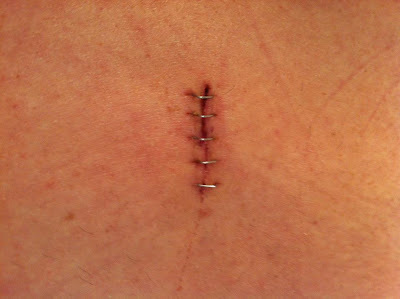 He called it “new pain”, a lot of which was bone pain in his back, where the surgeon had to drill through his vertebrae. He had to increase his muscle relaxers and pain medication a little from what he was down to over the weekend, and today he had a much better day. Dave’s been enjoying getting to work on his model railroading again — he hadn’t done much with his layout at all since he took command back in July. Getting back into his train room really cheered him up. He’s also enjoying endless DIY Network shows. He seems to particularly like “Bath Crashers” and “Renovation Realities“. We took a family walk this afternoon with the dog and Dave was almost walking “too fast”…he seemed to be moving as if he had no work done on his back. He had to remember to slow things down some. Pretzels! Today we got a nice surprise from Dave’s parents. Hammond’s Pretzels shipped from Lancaster, PA.
A huge box of Hammond’s Pretzels! Many of you have had Hammond’s Pretzels before, perhaps because we brought them to you as gifts. Perhaps you’re already in Lancaster County and can get them at your local Stauffer’s or Weis Markets. Yes, the pretzels are individually wrapped, which will be shocking to many folks. After all, that’s a lot of plastic! But I’ve received the pretzels both individually wrapped and not individually wrapped. The latter will arrive as a box of crumbs. Trust me, if you want the goodness of Hammond’s, you need to tolerate the packaging. It’s worth it! These are very hard pretzels, and most of them don’t have too much salt on them. You’ll definitely taste the baking soda flavor, which I personally like. Today I was able to get a lot of housework done, and I plan to do more tomorrow. Since the weather is cooling down, I’m able to move some of the boys’ toys back out to the back porch. Things got crowded in the boys’ rooms this summer — I had to move a lot of items inside so they wouldn’t warp and get moldy from the heat and humidity. Dave Update: Yesterday Dave got the 5 little staples out of his back. That helped him to lie on his back more easily. On the way home from the doctor’s appointment, he made a brief visit to the squadron to say hello. I promise, he didn’t do any work! He only logged on to his computer long enough to free up space on his e-mail server so he wouldn’t get those “Your mailbox is over its size limit.” messages. However, he’s also trying to back off of his muscle relaxers some so that he can think straight. After about a 1/2 day not on muscle relaxers, Dave was able to do some much-missed model railroading. But this morning he awakened in a pretty uncomfortable state. So he’s back to the 1/4-doses of muscle relaxers for now. It makes him groggy and less-focused. He was alone for much of Tuesday while I went to a doctor’s appointment at the Pensacola Naval Hospital (why there and not Eglin AFB, I don’t know) and took the Prius for some maintenance. Somewhere in there I need to fit a grocery store run! And now, on to the cooking! In the meantime, I’m going to share with you a much-loved dinner option in our house, especially in the cold weather months: homemade Cincinnati chili! For those unfamiliar, Cincinnati chili is quite unique. The chili itself is little more than meat, tomato sauce and a spice blend. There’s cinnamon in the spices, which gives it a unique flavor. In southwest Ohio, where Dave and I lived 2000-2002, you’d see Skyline Chili and Goldstar Chili restaurants all over the place, nearly as common as McDonald’s. You can get the chili in cans at Ohio grocery stores, and on the Internet now. It’s so yummy, but very fattening and high in sodium. My parents shared a recipe with me several years ago that they used with ground turkey instead of ground chuck to keep things a bit healthier. We’ve done it this way for years and have never looked back! With all the spices, does it really matter what kind of meat it is? Some might say yes, but none of us here care! This is not quite the same recipe as what my parents use, but this is the one I use. It’s called “Cincinnati Empress Chili“, based on the chili recipe from Empress Chili Parlor in downtown Cincinnati. 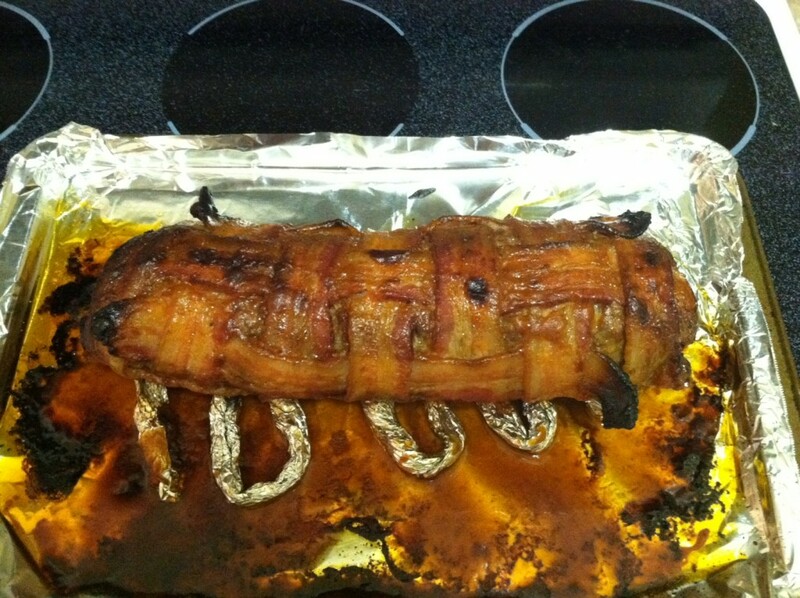 I invite you to click for the link, since it’s not my recipe exactly. I always make a 1/2 recipe for the family, so I will share how things are done at the house. I tend to make this on Sundays, when I can start it up around 2-3pm and let it simmer during the late afternoon football games. Start by dicing two big onions. The sweeter, the better! I dice them down nice and fine. I’ve gotten pretty good at this over the years. Toss them into a Dutch oven that has 1-2 Tbsp. of hot olive oil. “Sweat” them for a couple minutes. Add 3 minced garlic cloves. I used a Pampered Chef Garlic Press, it was much easier that way. Next, add 2 lbs. of ground turkey. We have Butterball-brand here. I know…ew, right? Like my Pampered Chef Mix ‘n Chop? It’s magic for making browned meat super-fine! Perfect for this chili! Chili powder, cinnamon, cumin, paprika, ground coriander, ground allspice, ground cloves, mace and a little oregano. Stir it into the meat/onion/garlic mixture and inhale deeply. The smell is divine! 8 oz. 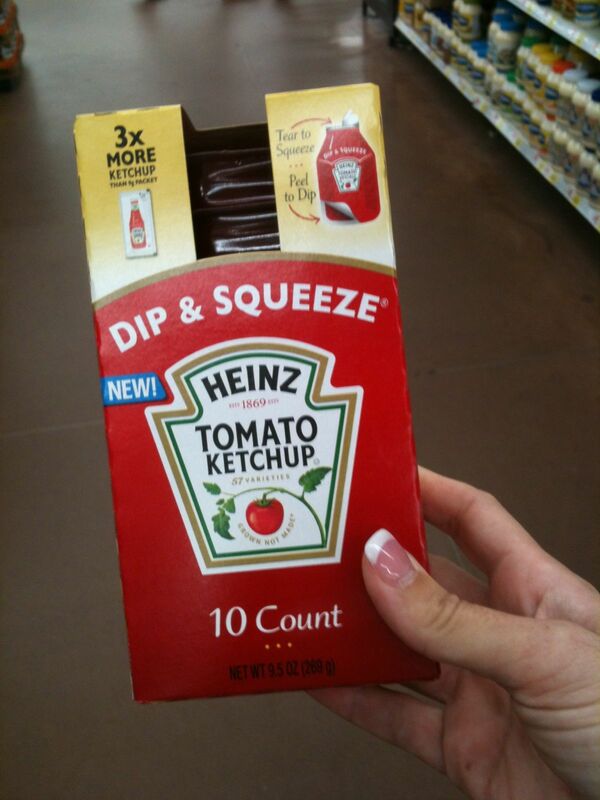 of plain tomato sauce. 1 Tbsp. molasses. Pardon the mess. 1 Tbsp. of wine vinegar. Mix that all up with 1 1/2 cups of water, place a splatter screen on top, and let it simmer for 2 hours. Meanwhile, you’ll want to chop some more onion, shred some cheese, break out a can of red beans and get some oyster crackers ready. Boil up some spaghetti while you’re at it. Offer up some hot sauce and oyster crackers, and you’re set! Here’s Jacob’s “four-way” Cincinnati chili from Sunday night. He’s been waiting since last May for this meal and he devoured all of what you see here…and asked for more! Good Monday morning to you! Today is Dave’s one-week check up for his back procedure…most of what we’re going for is to get those staples above removed. That entire cut is about an inch long and is healing very nicely. But those staples are driving Dave mad and he can’t wait to get them out. We’re starting to see a trend — Dave awakens in really good shape, he takes it easy during the day, with a walk or two up and down our street (about 1/2 mile at most). Most of the day, he’s in decent shape and in decent spirits. By dinnertime, Dave get very sore and his muscles begin to seize up. He isn’t as debilitated as he was on his first day home from the hospital, but we’re hoping the evening discomfort eases up some soon. Dave is craving visitors. Big time. He wishes he can sit at his model railroading workbench and work on all sorts of projects, but he can’t. He wishes he could get going on the next block of his Air War College studies, but he’s on hold until they grade the test he took the week before his surgery (he can’t move forward unless he receives a passing grade on the test). So he’s watching a LOT of TV. Mostly movies on HBO and Showtime. The kids and I took it easy yesterday morning, and in the afternoon I took the kids to our local Chuck E. Cheese restaurant in Pensacola for a birthday party. We were invited to a set of triplets’ birthday parties…for the first time, the girls were getting three small separate parties. We go to church with the family and the triplets are in Timmy’s Sunday school class. You could see their separate personalities come through even with the themes of their three parties: one at a bowling alley, one at a local pet shop and one at Chuck E. Cheese’s. Since we live about an hour away, the boys chose one of the parties and we brought Littlest Pet Shop gifts for all 3 girls. The birthday girl is in the hat, one of her sisters is on the far left, and I don’t know where the third sister is. The little boy to Chuck E. Cheese’s left wasn’t part of our party. Now that I’m feeling better from my cold last week, I think I can start on my household to-do list: organizing closets, sorting through toys and clothes, and washing/waxing our vehicles. I hope to take a Honda-Pilot-full of stuff to the Hurlburt Thrift Shop by Thursday or Friday for donation/consignment. Tomorrow I’m planning a long-overdue recipe post! Cincinnati chili made with ground turkey — a family favorite! 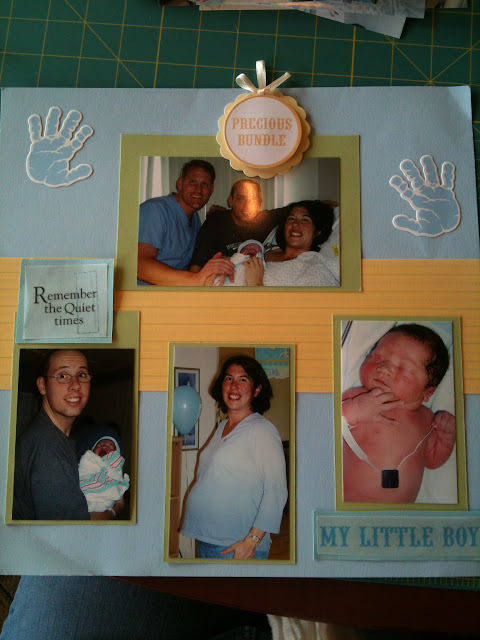 Timmy’s First Year Scrapbook, Finally! Well before Dave’s surgery was scheduled, I had arranged with a childhood friend Angela to meet for a weekend of scrapbook cropping on November 3-5 with some other ladies. We pool our resources — such as all those computerized, digitized tools that I haven’t invested in yet — and banter ideas back and forth. I love doing these, and I hadn’t been to a crop since I was stationed in eastern Florida right after Timmy as born! Most of the ladies booked rooms at a hotel on the beach and we rented one of the hotel’s meeting rooms to do the cropping, but my plan was to do marathon cropping during the day and sleep at home at night. Our view from the meeting room we rented to crop. We’re playing it by ear, but today I was able to go out and join in on the crop briefly while the boys were at school. Dave stayed home and since I wasn’t far away, I could be back quickly if there were problems. 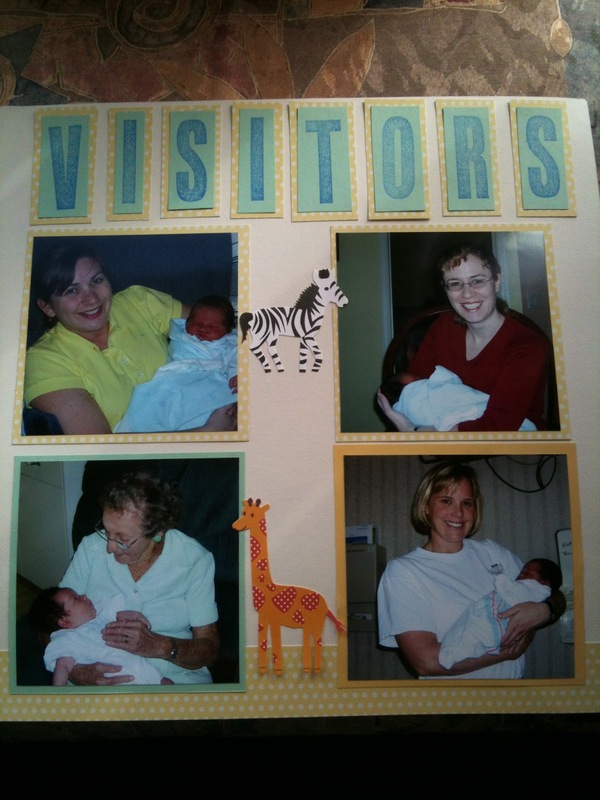 There’s a page to the left of this titled “FIRST”, that looks the same with four other visitors (mostly family). 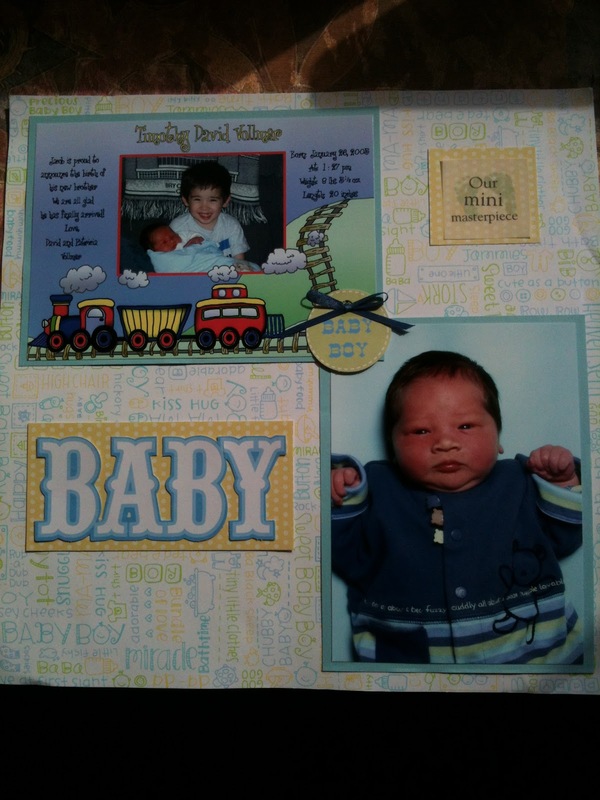 This is a pre-made page that I won as a door prize at a Stampin’ Up…or was it a Creative Memories? Party. Today I just had to add the pictures and the word cutouts. Some “journaling” (i.e. captioning) will go on the right side of this page. A caption will go in the lower right. Before I get into the main topic of this post, first let me say that this was a much much better day for Dave’s recovery. He woke up in a good mood, and seemed to do well while I was briefly at a Hurlburt Spouses’ Club board meeting during mid-morning. He even took a couple walks to the mailbox and back. Things are looking good. His surgery sites are still very sore, but at least he’s prepared for that pain and is coping. Yesterday (Wednesday) was pretty rough. So, marshmallows. I like marshmallows a lot. I always have. S’mores are a favorite dessert at our house, which we’ll make in our backyard on summer evenings in our firepit. I made a stupid impulse purchase at Walmart yesterday while grocery shopping. My word, these things STINK! I smelled them in the car all the way home, then they took over the smell of my kitchen. Some sort of artificial chocolatey chemical smell. I ate ONE. It was 90 calories. Didn’t feel so hot afterwards. The rest are in the trash, and that’s $2 wasted. The odor was nauseating. On the other hand, I found these ketchup packets for sale at Walmart and am glad I no longer have to steal have extras of them from Chick-fil-a. Today I was at the same Walmart picking up a prescription and when I picked up some last minute groceries (I’m always suckered into picking up more than one item at Walmart, don’t you?) and I walked past the endcap with those stupid marshmallows. Oh, the SMELL….